Contributors - Welcome to PT2Go! Contributors - Welcome to PT2Go! Meet Ms. Jenna Larsen, M.S. For nearly a decade, Jenna Larsen has been immersed in the field of nutrition. She is constantly fascinated by how a healthy diet can have such profound effects on the human body. Jenna followed through with her passion for nutritional sciences achieving her Master of Science degree from the Institute of Human Nutrition at the prestigious Columbia University. Her thesis setting was in public health, where she developed and implemented an evaluation of the NYC Walkers for Wellness program. She has also summarized research articles on sugar-sweetened beverages used for policy development. After graduate school, Jenna became interested in nutrition education for chronic disease prevention, working as coordinator of the state-funded program, Eat Well Play Hard in Child Care Settings, which educates preschool children, their caregivers and child center staff about nutrition and physical activity in low-income NYC neighborhoods. In her spare time, Jenna volunteers as vice president for the non-profit organization, Lupus Foundation Inspiration for Excellence (L.I.F.E), which provides scholarships to college students who have been diagnosed with Systemic Lupus Erythematosus and are continuing their education despite the hardships brought on by their disease. Prior to graduate school, Jenna obtained a Bachelor of Science degree in nutritional sciences from the University of Arizona. She conducted and presented research in the same field as a NASA Space Grant intern. She is a native of Minnesota and has resided in New York City since 2010. In her spare time, you can find her running, practicing yoga, refining her photography skills, at a coffee shop, connecting with friends, or discovering new restaurants. Meet Mrs. Kathryn Harris, M.S., A.T.C. Kathryn received her Bachelors degree in Athletic Training and her Masters in Sport Psychology from Ithaca College. Before working with Division I athletes at Cornell University, she was fortunate enough to work with middle school and high school athletes as the Head Athletic Trainer for the Elmira City School district from 2008-2012. 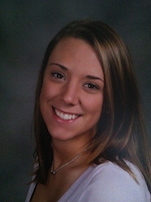 Presently, Kathryn is a Certified Athletic Trainer (ATC) at Cornell University. Her primary role is overseeing the Women’s Varsity Ice Hockey Team. In the off-season, she works with the Women’s Varsity Softball Team and Men’s Varsity Soccer Team. When not on the field, she is collecting data for the Ivy League Concussion Study. Kathryn has always had a vested interest in sports medicine. During her time as a Masters student, she was able to hone her focus on the ever growing fields of injury prevention, concussion, mental health, and athletic training education. When not in the training room, you can find Kathryn cheering on the Ithaca College Bombers, Cornell University Big Red Bears, playing basketball, spending time with friends, and getting ready for her first child with her husband Greg arriving July 2014!